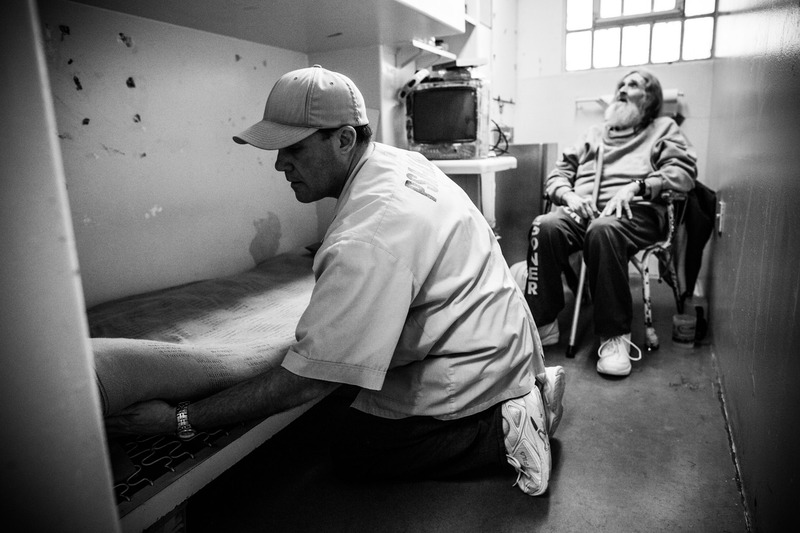 David Barnhill (L), a prisoner and member of the Gold Coats program, makes the bed for fellow prisoner Frank Fuller at California Men's Colony prison on December 19, 2013 in San Luis Obispo, California. The Gold Coats is a volunteer care program where healthy prisoners care for elderly prisoners who either need general assistance with mobility and every day life or who also struggle with Alzheimer's and dementia. The program, the first of it's kind in the country, has existed for approximately 25 years. Barnhill, age 44, says he has volunteered with the Gold Coats program for "a few years." He is 19 years into a 25-years-to-life sentence for murder; he goes before the parole board in 2017; this is his third time in prison. "I had been a pretty selfish guy most of my life," Barnhill continues, "I thought I had to avoid my emotional life at any means necessary, but about 6 years ago [the prison officials] encouraged me to confront that," so he joined the Gold Coats Program. When you're a young man, he explained, "You take the belief that something is wrong with you and the way that makes you feel is the root of a lot of problems. It probably took 15 years for me to see that." He says one particular inmate, who has since been paroled, and one psychiatrist, helped change his life. "The excuse you hear is that the prison system doesn't rehabilitate people," Barnhill continued, "but the honest truth is that you have to rehabilitate yourself. He is also currently in a two year program studying to be an electrician, and hopes to train to be a plumber after that.